Modern scientific studies have shown that the Mediterranean diet, with its heavy reliance on products from the Olive tree, is one of the most healthful in the world. Olive Leaves contain a number of compounds, mainly phenols and lignans, that protect the plant from environmental stress and confer health benefits when consumed. Oleuropein, one of the best known active constituents of Olive Leaf, has been endowed with many health promoting properties linked to its antioxidant activity. 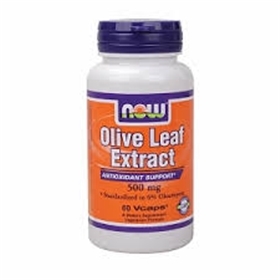 Olive Leaf Extract is a natural botanical product that has been a subject of study since the early 1800's. This specific extract of olive leaves (Olea europea) is manufactured under strict quality control conditions. Olive leaf kills or resists the multiplication of a broad range of viruses, bacteria, yeasts, fungi, and other parasites in your system. it inactivates pathogens (disease-causing organisms) without harming the good gut bacteria, which is a major advantage over most antibiotic drugs as about 70% of your immunity resides in your gut with good bacteria playing a key role. Cardiovascular-Prevention of atherosclerosis and hardening of arteries. Olive leaf compounds inhibit the oxidation of LDL cholesterol. Oxidation of LDL is one of the first steps toward the thickening of arteries and progress towards the condition of atherosclerosis. The anti-inflammatory properties of olive leaf extract reduces the aggregation of blood platelets on inflamed arterial walls. Arthritis-Reduction of arthritic pain and swelling. Olive leaf seems to work very well for this in some people, and a habit of drinking olive leaf tea, using olive oil as a salad dressing and taking olive leaf extract supplements during severe bouts of arthritis would be a good long term strategy to prevent and counter rheumatoid and osteo-arthritis.The anti-inflammatory properties of olive leaf extract can be very effective for arthtitis, gout, reumatoid artritis, and other painful conditions. Suggested Usage: As a dietary supplement, take 1 Vcap® 1 to 3 times daily as needed. Consider taking this product in combination with NOW® Colostrum, Respir-All™ and Immune Renew™.